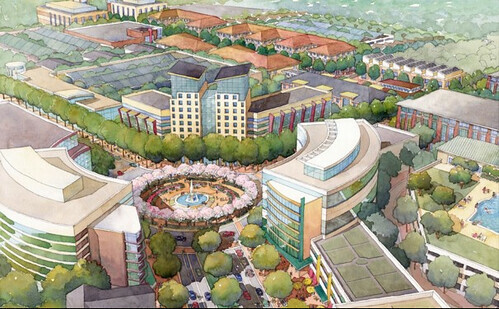 One thing was clear at last night's public hearing on plans to create a transit-oriented town center and biotech hub in White Oak: almost everyone wants more jobs and amenities in White Oak, even those who aren't comfortable with new development in their backyards. LifeSci Village, a proposed research park in White Oak. Rendering from Percontee. This month, the Montgomery County Council took up the White Oak Science Gateway plan, seeks to draw companies who want to be near the Food and Drug Administration's campus near Route 29 and New Hampshire Avenue. It proposes over 8,500 new homes and 40,000 new jobs in several urban neighborhoods, which would sit on three of the county's proposed Bus Rapid Transit lines. Support for the plan was high, with 20 of 34 speakers in favor. As in a previous hearing at the Planning Board in May, residents were eager for new investment after decades of waiting. Even those who were skeptical of the plan's emphasis on transit and feared it would create a "tsunami of traffic" on Route 29 said East County needed the investment. The County Council's Planning, Housing, and Economic Development committee will discuss the plan in a series of worksessions later this month before the entire council reviews it. No vote has been scheduled, but it's likely to happen within the next several weeks.